Cyril Hooke's Officer commissioning certificate, shown here, is a substantial piece of folded A3 card and personally signed by the King. The war began in earnest for Cyril and the Hooke family in 1916 when Cyril was 20 and he was called up for service in France. It must have been a moment of some trepidation for all the Hookes when this letter dropped through the letterbox of 100 Drakefield Road, Tooting Bec. Cyril had already been in training at Woolwich in the Royal Field Artillery and commissioned as an officer three days earlier. Cyril's big sister, Mildred, mused in a letter written much later in life how she had prayed for her brother's safety while he was serving on the front line in France yet was unable to see any reason why he should be divinely favoured when so many others were not. Later, he wrote and illustrated a notebook of his time on the frontline. You can see this and begin reading a complete illustrated transcript here. Below is a photo of one page of this WW1 memoir, his illustration of the Hindenberg Line. 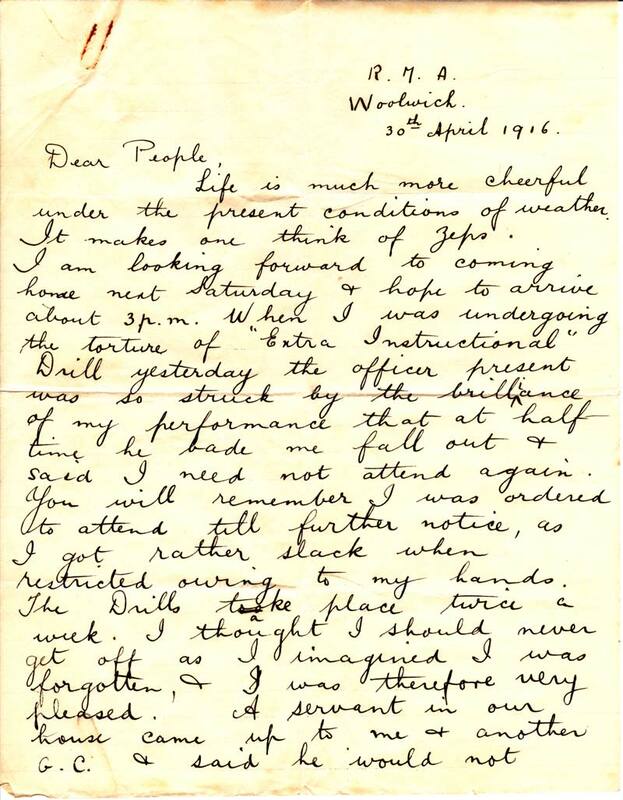 Earlier in 1916, Cyril had commenced Officer Training at the Royal Military Academy in Woolwich. 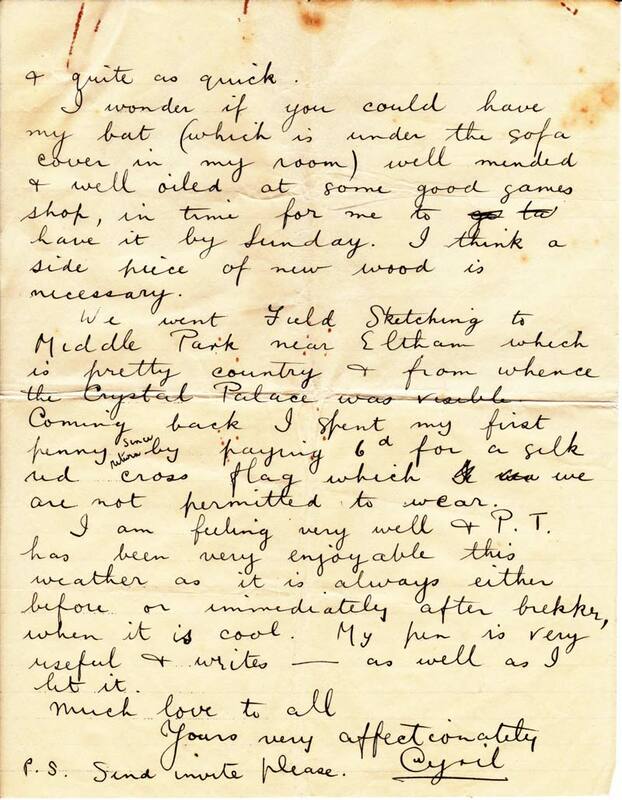 We have a couple of letters from his mother, written in March 1916, transcribed here. I have sent more white handkerchiefs as well as collars. I dare say you can do with them. Glad you found your clothes satisfactory. It adds greatly to your comfort. How unfortunate about your knuckles. These cold winds makes any cuts difficult to heal unless kept bound up. We are looking forward to seeing you. I suppose so many requiring uniforms makes a delay. I did not go out yesterday, the biting wind and sleet was not tempting. The day my left hand got so frozen it was painful for days. Everything very quiet. I have not much to chronicle. I expect Dad and Frances told you all news. Miss Goodman is very kind and comes in and spends Sunday evening with me as I am alone. She enquires after you. much love your affectionate mother. Shall be glad to hear how you get on with your hands. 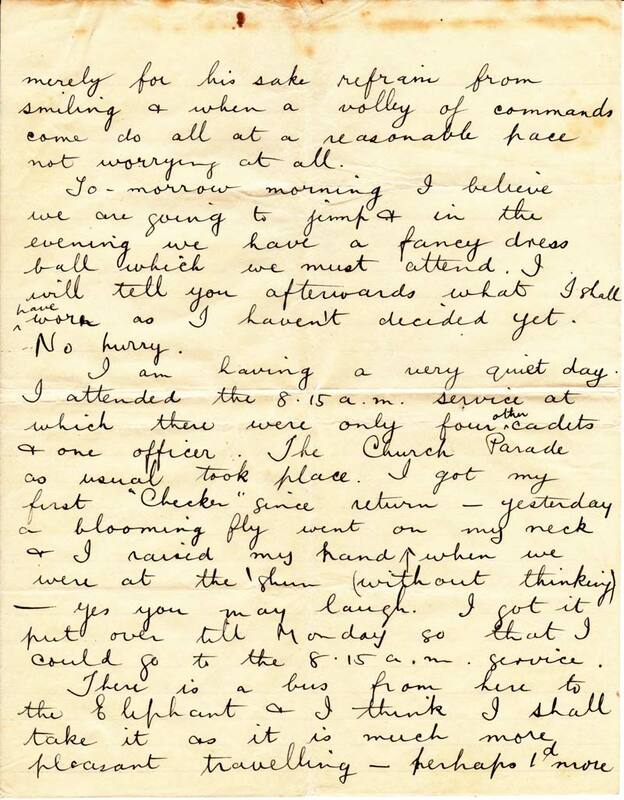 Cyril has written across the second letter from his mum, "I was at R M A Woolwich". I expect you had fine weather for your visit to Cobham, although cold. We had quite a blizzard here. Just after we three got home from the Abbey. Particles of ice all about the windows looked quite pretty. The pericope by the Rev Carnegie was the last of the three about "Christianity after the war“ it was very interesting. The Abbey was full of people. Evelyn Johnson has gone to France. His people were anxious in the fear he was on the Sussex. I believe he will go on a ??????????? boat. There were four from his regiment went. Graham I suppose has also gone. Frances went with me to tea on Friday with Mrs Freaker (?!). We played bridge. Mrs F picked it up very quickly. They seemed to enjoy it. If they lived nearer we could play with them sometimes. We all enjoyed your visit last week. Ruth shall hope to see John on the 8th. It will be good to be all together again. I took Auntie Maria to the Coliseum last Wednesday. It was very good. The place was full as usual. I am afraid we have not much to tell you as we met so recently. We are all well, and I hope that your hands are quite all right again. Is the riding progressing favourably? I often think of you, and I trust that you will like your profession more and more. With love. I expect to hear from Dad, how you are and so on. PS. We are thinking of clubbing for a wristwatch for Ella’s 21st. 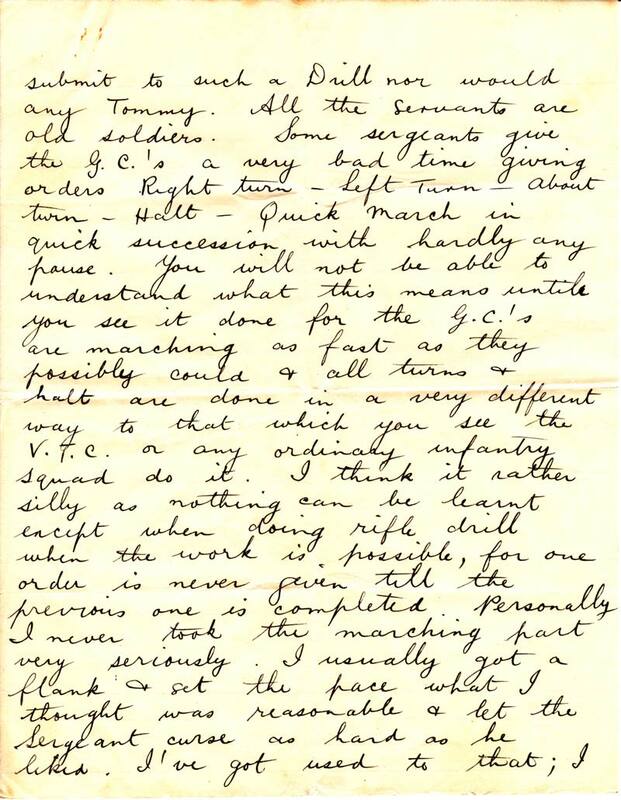 We have one long reply from Cyril (30th April 1916) from the RMA, Woolwich - four pages long! His sense of humour and growing self-confidence is evident and his writing is just about neat enough not to require transcribing!